Poundworld launching online store. Would you use an online pound shop? The Poundworld Plus website has gone live, bringing Poundworld from its 270 shops on British high streets to the web. However, if you want to get your pound shop bargains online there are a couple of downsides - which could be enough to put many people off altogether. 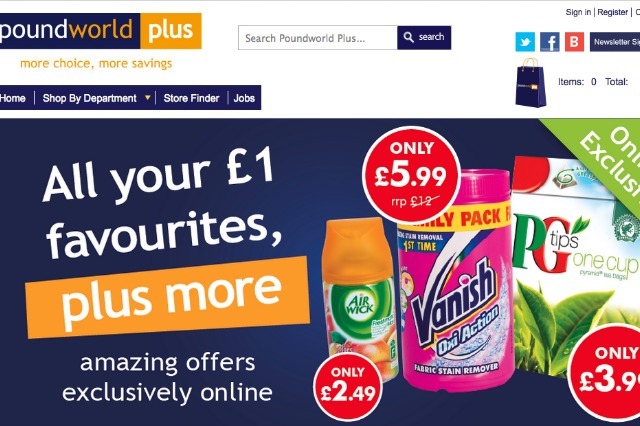 Poundworld has launched with some fanfare, announcing an enormous online store, stocking 4,000 different products - including a number that don't cost £1. Chris Edwards Junior, trading director at Poundworld Retail, said in a statement: "Value and convenience are top priorities for the UK shopper. There is a huge consumer demand for an online store that delivers good, transparent value and consistent prices that the shopper can trust. As a retailer it's important for us to constantly progress and evolve with the times and so we've had a dedicated team working on the site for over one year to ensure that the shopping experience we are offering is easy to use." The problem is that the site requires you to spend at least £20 at a time, and even then you'll pay £3.95 for delivery - or £5.95 for delivery the next day. For many people, popping into a pound shop involves a relatively tight budget, and if you're shopping around for a store that will cut a few pence off the price of your tins of soup, you're hardly likely to fork out the best part of £4 to have them delivered. It's not the first pound shop to start trading online. Poundshop.com has been around since February 2014, and is backed by Steve Smith, the founder of Poundland. In October last year it joined forces with the second largest online pound shop, Hereforapound.com, to become the biggest online pound shop in the UK. It has a number of delivery options. If you are spending up to £19 you'll pay £3. If you spend £20 or more it's £2, on orders of £25 or more it's £1, and if you spend over £30 then you'll get free delivery. Next-day delivery is also available for £5. There are also a number of smaller players, including the onlinepoundstore.co.uk which offers free delivery if you spend over £20, and 99plandcom, which delivers for free when you spend more than £30. It seems brave to launch into a marketplace with such fierce competition, and yet be one of the few who will not deliver for free if you spend enough money. But what do you think? Would you shop at an online pound shop? And would you pay for delivery? Let us know in the comments.